The Wood Shed first opened its doors in 1976 under the name of Can Do Furniture. 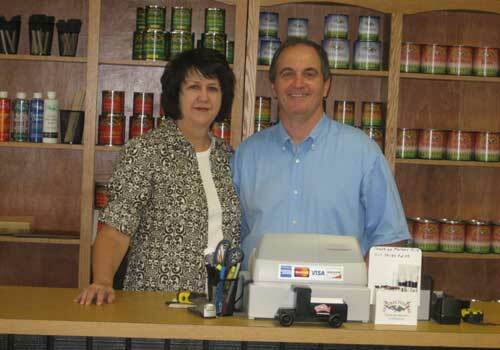 Merri's uncle and aunt, Jake and Betty, purchased the business in March of 1980 and changed the name to The Wood Shed. Jake and Betty decided to retire and hand over the business to Benny and Merri on January 1st 1990. It was Benny's dream to own a business and keep the small-owner's vision going. With over 8,000 square feet of showroom and warehouse space, Benny and Merri sell quality wood products - no particle board here! Based out of Tyler, TX, our showroom features many ready-to-sell items. We service the immediate Tyler area as well as the surrounding cities and states to East Texas. We also sell a full line of stains, paints, finishes, and glazes in addition to providing finishing services. At this moment, we are not capable of shipping. All items must be picked up at our Tyler location.